So far, I've come up with "Be _ _ for two" where the bumble bee indicates "be" again, the number 4 translates to "for", and the picture of the two people indicates "two." What I can't figure out is what the stalactite like image means, and what the construction vehicle that is building what looks like a house means. I am also not sure if my assumption about the two people is correct. One thing to notice is the stalactite like image has some lines come off the one point, which may mean "pointy" or "sharp" but I couldn't see how those words would fit into this puzzle. 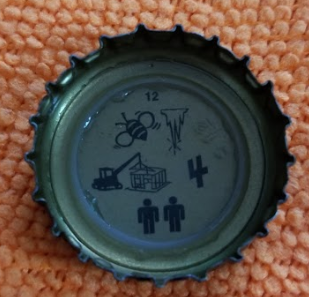 Also note that the number 12 at the top is not apart of the puzzle. bee, icicle, built, 4, two.